Annuals (sometimes persisting), 5-35(-60+) cm. Leaves cauline; petiolar bases 0-3+ cm; blades linear, oblong, or spatulate, 1-5(-12) cm × 4-12(-35) mm, (bases of distal ± clasping) margins usually entire, sometimes toothed or lobed, faces closely strigillose or hirtellous to ± villous (hairs jointed). Peduncles 3-10(-20) cm. Phyllaries 18-28+, narrowly triangular- to linear-attenuate, 6-14+ mm, usually ciliate with jointed hairs. Receptacular setae 1.5-3 mm. Ray florets usually 8-14, rarely 0; corollas usually reddish to purplish proximally, yellow to orange distally, rarely yellow, reddish, or purplish throughout, 13-30+ mm. Disc florets 40-100+; corollas yellowish to purple or brown, often bicolored, tubes 0.8-1.2 mm, throats campanulate to urceolate, 3-4 mm, lobes deltate to ovate, often attenuate, 1-3+ mm, jointed hairs 0.3+ mm. Cypselae obpyramidal, 2-2.5 mm, hairs 1.5-2 mm, inserted at bases and on angles; pappi of 7-8 deltate to lanceolate, aristate scales 4-7 mm (scarious bases 1-2.5 × 0.7-1.3 mm). 2n = 34. Flowering Jan-Dec, mostly May-Aug. Sandy or calcareous soils, often disturbed places, mostly in grasslands or open places; 0-1800 m; Ala., Ariz., Colo., Conn., Fla., Ga., Kans., Maine, Miss., Mo., Nebr., N.H., N.Mex., N.C., Okla., S.C., S.Dak., Tex., Vt.; Mexico (Chihuahua, Coahuila, Nuevo León, Sonora, and Tamaulipas). Spring-flowering plants with most of their proximal leaves pinnately lobed or coarsely toothed, mainly found in south-central Texas, have been treated as var. australis (B. L. Turner and M. Whalen 1975). 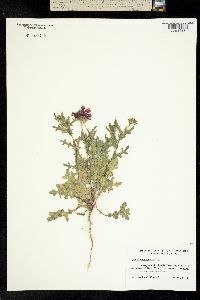 Plants from near or on beaches of the Atlantic and the Gulf of Mexico, usually with somewhat fleshy leaves and often persisting for more than one year, have been distinguished as var. picta. Cultivars of Gaillardia pulchella (or of hybrids between G. pulchella and G. aristata) are used horticulturally.